Since its launch in 2014, the Sandugo International Fusion Nights has been a megahit to Boholanos and is one of the most awaited events in the annual Sandugo Festival. This year, countless food aficionados and mavens visited the Sandugo International Fusion Nights as part of the Sandugo Night Market at the CPG Sports Complex to have a taste of both international and local food. Every night is a busy night in the venue. This is evidence that the Bol-anons have a huge fondness for food. More than 25 food-preneurs, resorts, hotels and restaurants were invited to join the 4th year of the activity. The Bohol investment Promotions Center (BIPC) in partnership with the Bohol Assciation of Hotels, Resorts and Restaurants (BAHRR), has cooked up and prepared a bigger, better and more fun-filled fusion nights this year. Different categories of food stalls and kiosks are being showcased this year. For concessionaires of the up and coming food spots in the province, Wings St., Hola!, Just Sizzlin’, Paengs Fried Chicken and Massimo were among the participants. This is perfect for those who want to try to have a taste of the newly established food stores in Bohol. For those who crave for sweetness and in the contrary, bitterness, the coffee and dessert concessionaires are perfectly here to satisfy you. Among the participants are Moshi, Kitchen with Rose, Cakegarden, Chong Café and Gelateria Milano. The hotels and resorts concessionaires are perfect for those who want to have a taste of luxury and finesse on a more affordable price. The hotels and resorts who participated this year are Alta Bohol, Astoria Bohol, Tarsier Botanika, The Bellevue Bohol, Bluewater Panglao, Be Grand Resort, South Palms Resort, Belian Hotel and Bohol Shores. Lastly, a savor of authentic Boholano and Filipino cuisine. Simply delicious and homely. The Filipino and Boholano concessionaires are participated by Abi’s Seafood and grill, Egay’s Farm Restaurant, NL Aseniero’s Catering, Klerabella’s Eatery, Mellow Apartelle and Tourist Inn, Home Cooking by Daisy Haliare and Eleonor Alberto, M. Lagura Food and Catering and Cusina ni Tisay. If you’re looking for a place where you could have a wide variety of food selections, then the Sandugo International Fusion Nights is the perfect place to be as it will give you a mix of everything you want to devour. 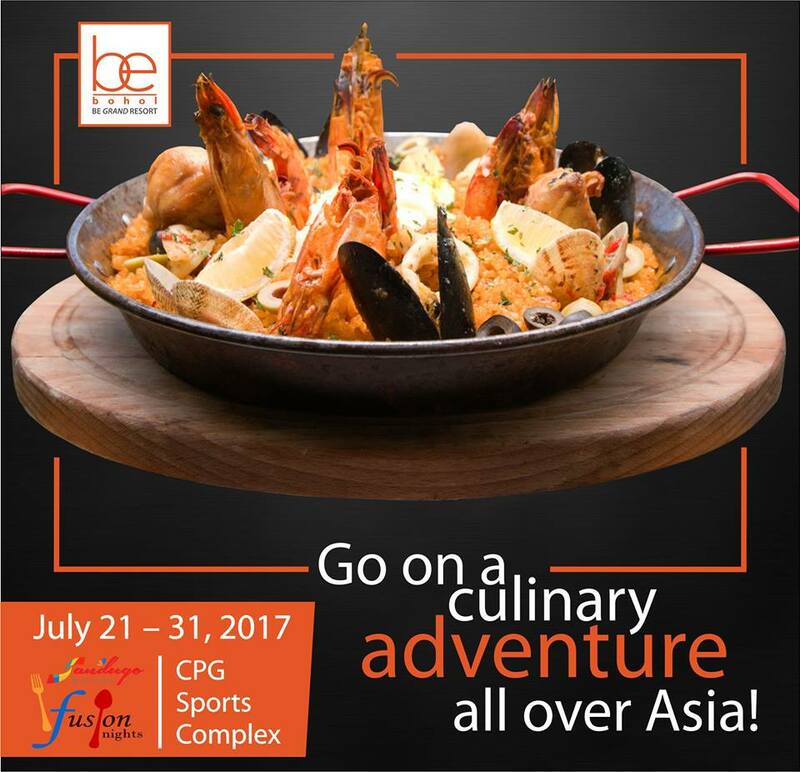 The food festival will run from July 21-30, 2017 from 5PM-12MN.